Anyone can make a scrib! It tiles seamlessly both horizontally and vertically, makes terrific frames or borders, web or desktop wallpaper, and it is a fun element to use for color experimentation. Here's how to make your own. Open a new image window in your paint program. Use a "small" but generous size, such as 200 x 200. This is the fun part, so go ahead and enjoy it! Use the pen tool at various widths. Use the airbrush. Use chalk. Use crayon. Use a combination of several brush tools together. Have fun, go wild! (You can add filters and textures at this point, too!) 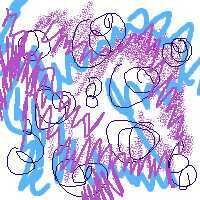 Your finished scribbling might look something like this one. Maybe it doesn't look like "great art" yet,but you might want to save your scribble if it's a particularly intriguing one, because they can be used and re-used over and over to create new and interesting designs, depending on where and what size your step #5 selection is made. 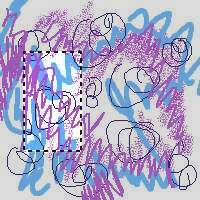 If you don't want to save it, that's okay, too, since scribbles are fun to make and it's very easy to make new ones. Now, to create the Scrib tile! Select a portion of your scribble with your rectangular cutting tool. It can be a large chunk or a small slivver, horizontal or vertical or square. When you're new at this, I suggest using a good chunk, not too small, because it'll be easier for you to move it around. I chose a portion just left of the center of my scribble. Copy your selection and paste it into a new window. Assuming this new window is the same size as your selection, resize it now to 200% (twice as large in both directions). Now clear it to make it blank. Paste in your Step 5 selection that should still be on Clipboard in its original size. Position it into the top left corner of the window. Mirror the window (which turns it horizontally, putting the left side in reverse to the right). Paste the selection again to the upper left corner. Flip the window (which turns it vertically, putting the top in reverse to the bottom). Paste the selection for the third time to the upper left corner. Mirror the window once more (turn it horizontally, putting the left side to the right). Paste the selection for the last time to the upper left corner. Now you have created a totally original, seamless tile from a simple scribble! I call this making a Scrib! Save it! Play with it! How your Scrib turns out depends on the scribble you start with and the all-important step #5 -- where and what size your selection is made. Having finished your first Scrib, you might want to go back to step #5 and try a different selection. Make a Scrib of that and see how different it looks from your first -- even though both come from the same scribble! Here are some additional Scribs I made starting from the same sample scribble above, but using different selection areas. Compare these to the finished Scrib in step #10, and you'll get an idea of just how versatile one simple scribble can be. 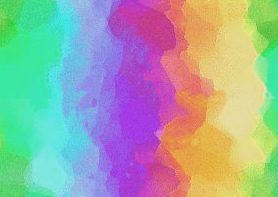 What if the scribbling had been done in other colors? What if a special effects filter had been applied prior to step #5? What if a fun plug-in like Blade Pro had been used on top of the scribble just for fun? What if the scribbling had been done using a font? What if you have even more ideas that could be tried out? The possibilities of the Scribs that can emerge is incredible and limited only by your imagination! What can you do with a Scrib now that you have one? Darn near anything! It is completely seamless tiling, so you can use it immediately for desktop wallpaper or a web page background (see a sample). You can made additional designs from it, by applying filters or adding more scribbling (for best results, particularly with methods like embossing, use these filters prior to step #5). Scribs make excellent border art (see a sample), and they also make "instant" framework for special messages (sample here). Can you think of other uses for them? Once you've started, you'll probably find the list of possibilities is virtually endless. Best of all, your Scrib design is completely your own! Whatever you want to do with it, you never need to worry about getting permissions or violating someone else's copyright. Your original work is protected by your copyright, so you can use it in any way you choose!